Varusham, Tamizh for ‘year’ and pirappu ‘birth’ is the beginning of the New Year in the Tamizh calendar. The Tamil New Year follows the vernal equinox and the first day and month of the year invariably occurs on April 14th. The Tamil calendar is based on the solar cycle. It has a sixty years cycle and each year has twelve months. After the completion of sixty years, considered to be the "Hindu century", the calendar begins anew with the first year. The Vakya or Tirukannitha Panchangam (the traditional Tamil almanac) is the almanac referred to for all auspicious and celebratory days. The month of Chithirai (April-May) is an auspicious one and marks the beginning of the marriage season. Tamizh new year’s day is celebrated with the reading of the Panchankam or almanac and the deity of the family is worshipped. On this day, the Sun God is invoked with a pinch of turmeric paste, or fresh cow-dung placed on a pedestal. On each side of it, a lamp is placed and an offering of rice is served on five plantain leaves. 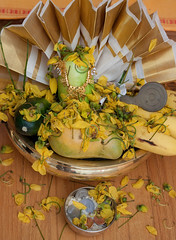 Clarified butter, sugar, bananas, coconuts and betel leaves are offered to the God. In many families, the Visu kani (pictured to the right) is placed before the deities in the pooja room. All kinds of fruits and vegetables with coins andsilver and gold are arranged beautifully. People wake up in the morning and open their eyes to this bounty and hope that their lives that year will be as rich and fruitful. The menu that day is an interesting mixture of many flavours. The sweet, sour, bitter and bland tastes and textures of the food augur a balanced destiny and teaches one to accept life’s sorrows and joys. Children also look forward to this day as it brings gifts and money from the elders in the family. May this year bring you an overabundance of happiness, health and personal growth! Today marks the new year in the South Indian calendars for Tamils and Keralites. Happy New Year!! What is Tamil New Year! Read More of Padmini's Articles here. Remember- every day is the begining not only of a new day- but a new year!! Enjoy the new day and new year everyday! 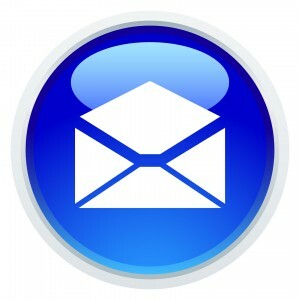 Thank you for reading and spending your time on Alaivani.com!